Our living wall is so lush at the moment. Choc full of shade loving perennials, beautiful begonias plugging all the gaps. There are some tender plants that won’t make it through the winter, however next year we’ll look to add some year-round interest. This one was built a few years ago by Uhi and the team using reclaimed wood for the uprights and horizontal batons. Pockets were created using Mypex and then filled with compost. 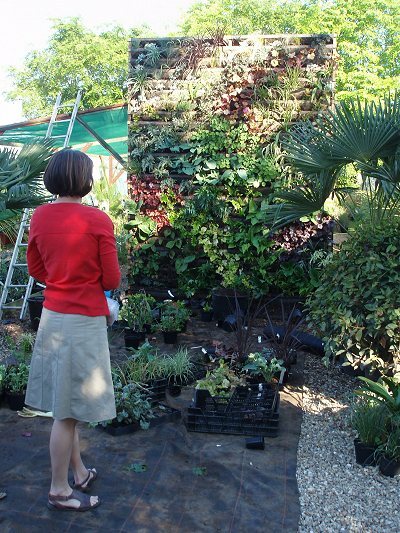 Very low maintenance and a fabulous way to add a colourful screen or cover an unsightly wall. 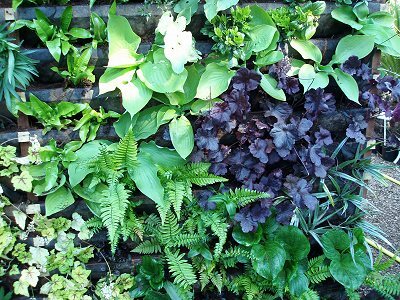 Our in-house Living Wall guru Jamie Spooner created this blog in 2011, however the principles are very much the same. He's travelling on the other side of the world at the moment, so we've resurrected this in-depth guide to help you build yours. 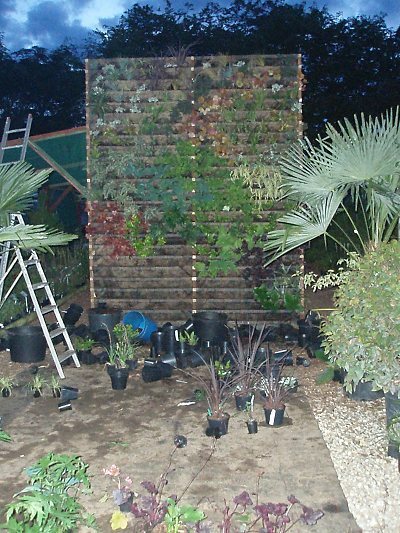 Once the wall is planted and watered it will be very heavy so a suitable structure is needed to support the wall. If the base of the wall is resting on the ground and this is not a solid surface, place slabs under each of the uprights to spread the weight and prevent it from sinking into the ground. 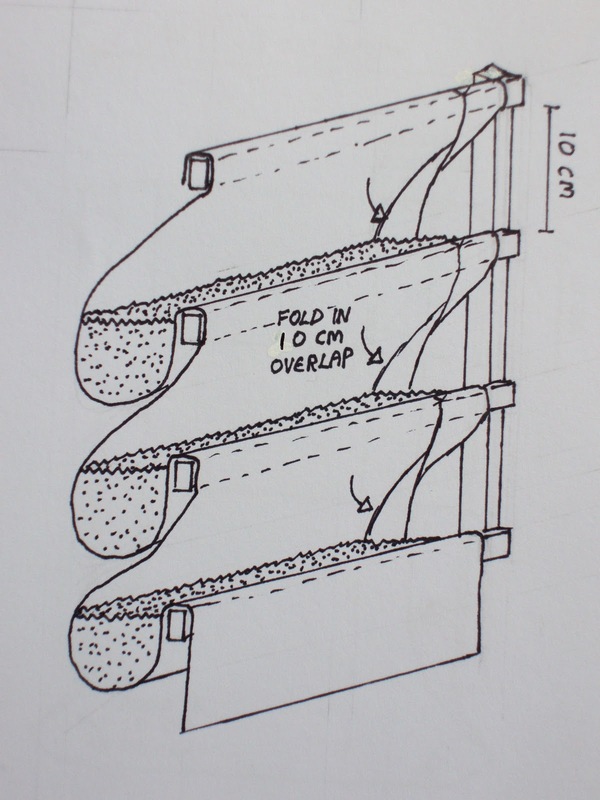 If the wall is not resting on the ground make shore the brackets used to hold the living wall to the supporting structure are strong to take the weight of the wall when saturated. If the supporting is a house or shed wall the structure should be mounted away from the supporting wall to leave a cavity and avoid causing damp problems. The place we chose for the wall at Urban Jungle by chance faces east. This in my opinion is the best direction for it to face as it gets direct light up until noon in the coolest half of the day. If the wall was south or west facing more particular attention would have to be paid to watering and plants would have to be selected to tolerate direct light. Regarding watering, it is important to be diligent as anyone who has let a hanging basket dry out knows it takes a while to re-wet, and you cant dunk the wall in a bucket. North facing walls would require less attention but the constant shade will limit the choice of plants. 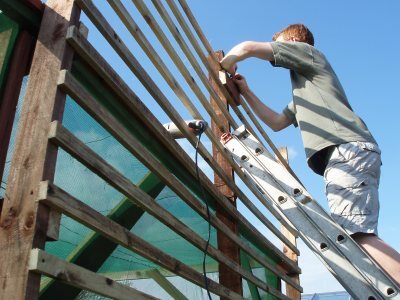 The wall at Urban Jungle was 12ft high, 7ft wide and build against a large pergola for support. I used three uprights made from 12ft lengths of 2×4 tantalised timber. The two uprights on the edge of the wall were attached to the uprights of the pergola with brackets and the middle upright stabilised by a post in the ground and two cross members. Each of the uprights was rested on a paving slabs to help spread the weight. The horizontal spars that support the planting hammocks were made from tile baton. Each spar was screwed in place with a little wood glue for extra support. The spars were placed 10cm apart. This made the pockets closemouthed together so that when planted not too much gaps are left but there is enough room to squeeze the root balls in. 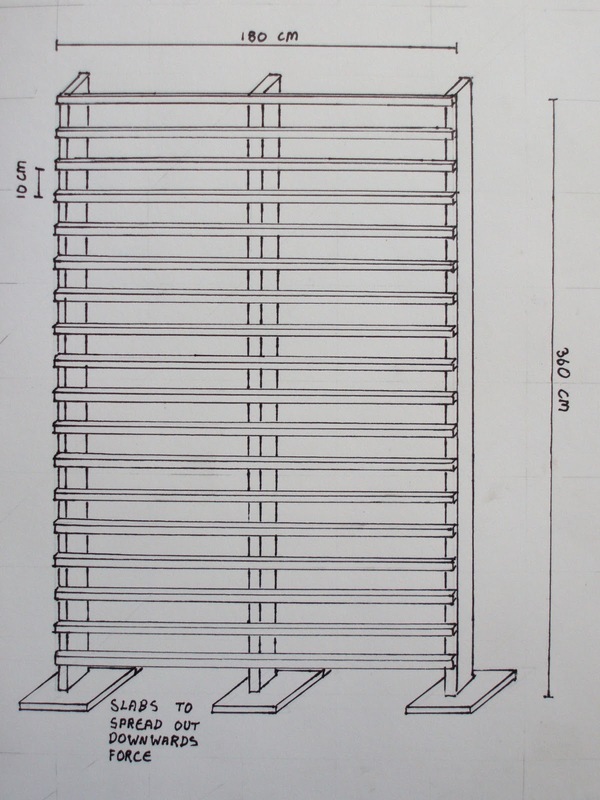 How to build the timber structure that supports the wall. Because the wall had three uprights there had to be two series of pockets as they cant cross the uprights. 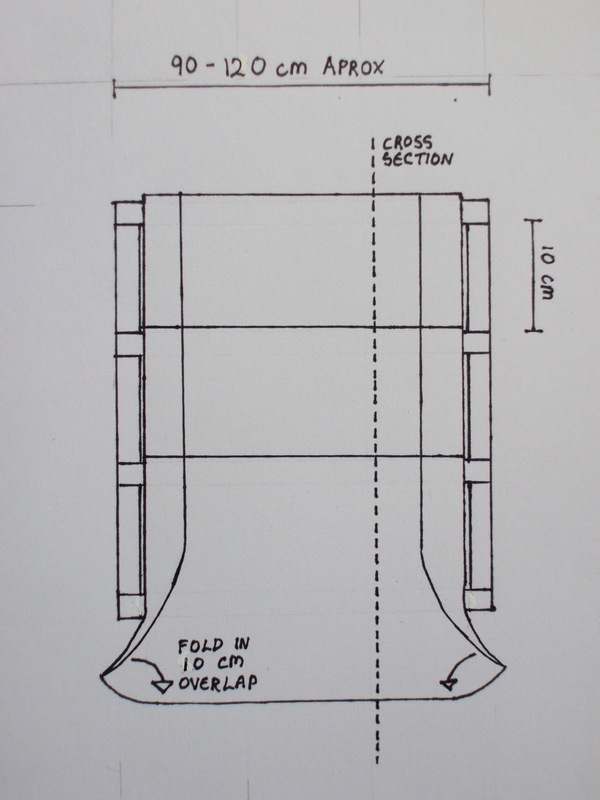 The pockets were made from heavy duty landscape fabric which needs to be about two and a half times longer than the height of the wall and about 20cm wider than the width between the uprights. Start by folding about 10cm in each side so the fold is facing the front and attach to the back of the top spar with staples or by screwing a second spar over it. Push the fabric in between the top and second down spar so it forms a pocket about 15-20cm deep. Place a few staples in the second down spar so the fabric doesn’t slip. This will not need to be as secure as on the top spar as the weight of the compost will hold each pocket in place. Repeat the process down to the bottom of the wall and securely attach the end of the fabric to the bottom spar. How to attach the landscape fabric to create the pockets. We decided not to add any ingredients to the compost like pumice or perlite to reduce the weight as we were happy that the structure would support the weight. We mixed plenty of slow release fertiliser granules into the mix as there will be a large amount of plants in a relatively small volume of compost. We also added a quantity of swell gel to aid water retention. Fill the wall from the bottom pocket up so that each filled pocket rests on the one previous. Fold up the excess landscape fabric that was folded in on either side to prevent the compost from spilling out the end of the pockets. Each pocket should only be filled three quarters as the root balls from the plants will take up a proportion of the space and the soil level in the pocket must be just below the spar so water can soak in and not poor off the wall. The newly planted wall before the leaves have turned up to the light. We set the plants out on the floor in front of the wall to create a design before we started to plant. Spacing will depend on the plants you use and the size of the plant used. Start planting from the top down. If you plant from the bottom up the lower plants will be covered with compost. Lay a sheet down bellow the wall as a lot of compost will be spilt. Make shore the plants are well watered before planting as many of the root balls will have to be teased apart and squeezed into pockets. Despite our planning we changed the design considerably while planting as it looked so different when vertical. Liz more so than other gardeners is a very impatient gardener so we planted a little closer than was probably necessary and plugged the gaps with Tradescantia cuttings, Spider plants and Begonia sutherlandii. These quickly grew and filled the gaps. We debated weather to use only evergreens but decided this would be too limiting on the design possibilities and would make the wall predominantly green. The down side to using deciduous or herbaceous plants was that the wall will look a little sparse over winter. We put a few dwarf Daffodils in the wall to see how they would fair. These wouldn’t hide the landscape fabric, but would add a splash of colour before the new shoots emerge. The wall will have to be completely manually watered. Rain will have little if any benefit to the wall other than slowing the rate at which the wall dries out, plus the leaves will arrange themselves like roof tiles shedding all the rain water. We didn’t get around to installing a trickle irrigation system and hand water the wall daily, sometimes twice if it is really hot and or windy. From autumn to early spring watering will be much less but still important. To install a trickle system there would need to be one trickle pipe along each pocket with dripper every 30cm or so. The dripper pipe would need to be the sort that delivers a specific flow of water rather than a simple leaky pipe as the bottom of the wall would receive more water than the top. The watering regime would have to be little and often to prevent the nutrients from being leached from the compost. The slow release fertiliser we put in the wall was more than enough to see the plants through the first season with no signs of stress. The second and subsequent years are where attention is needed. Each perennial plant should have a hanging basket pellet pushed into the compost near the root ball. Any annual or replanted patches should have the old compost removed and replaced with fresh compost and slow release fertiliser. The old compost will be matted with the roots of perennial plants which should be carefully cut without cutting the landscape fabric. If a trickle system is installed a liquid drip feeder could be attached or if hand watered use an occasional folia feed. 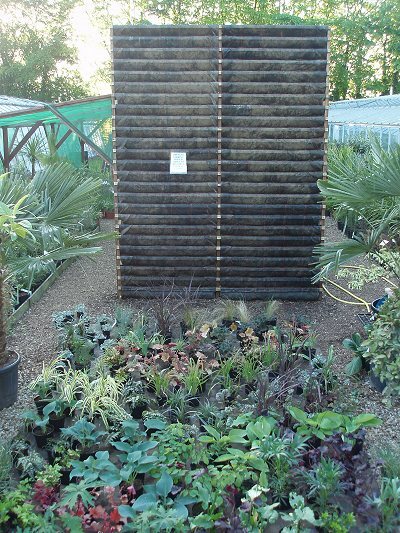 If you would like any more information on creating this or an indoor garden we would be happy to help recommend plants, you can contact us HERE.